The Eaton house in 1915, shortly after it was built. are sitting on the front porch. Some months before Ryley Smith married Myrtle Wanamaker in 1915, he bought a quarter section of land (32-17-8 W2) at Summerberry from his father George, and planted a crop there. This was the only parcel of land George had bought that didn't have a house on it. So George's wedding gift to the couple was a house - a mail order house from the Eaton's catalogue. When I first heard about this, I could hardly believe you could buy a house by mail order, but it wasn't all that unusual at the time. Eaton's and other companies sold a wide range of houses that way, along with the more mundane items such as clothing and household goods. A mail order house would arrive by train in all its bits and pieces, along with a detailed plan, to be put together by the buyer. George had all the materials delivered from Brandon Manitoba to Summerberry a few months before the wedding, and taken from there to the farm by horse and cart - several horses and carts. It was harvest time, so Ryley and a small crew were bringing the crop in while another group of friends and relatives built the house. Ryley's sister Grace helped too, by being the chief cook and bottle washer for both the building and the harvesting crew. She and Ryley both lived on the farm while the house was being built, sleeping in a grain bin. Looking at the floor plan, I have to agree with her. The size of the pantry was around 6x8 feet, and it left no good place to put a table in the kitchen. The only way to get to the dining room from the kitchen, without going down the hall and back through the parlour, was to go through the pantry. But its two doors weren't aligned with each other, which made it awkward to place things in there and leave a clear path. 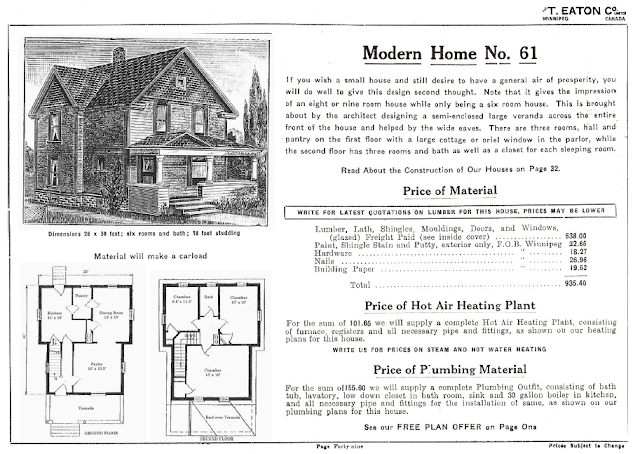 A page from the 1915 ' Eaton Plan Book of Ideal Homes' with details about the house. Click here to download an easy to read PDF version of it. Her wish (shall we say, demand, which also involved moving the dining room door sideways and adding a sink to that wall) was granted, and the house was ready to move into by the time the wedding rolled around in December 1915. It ended up with a nice big kitchen with room for a table in it - and that's where the family ate, except on special occasions. The counters in the kitchen were too high for Myrtle's short stature, so she used the kitchen table to do most of the food preparation. The drawback of getting rid of the pantry was that there was little storage space, but the house had a cellar, the door to which opened off the kitchen, and Myrtle had shelves and hooks put on the wall space over the cellar stairs, and she kept pots and pans and other items there. She often terrified people by opening that door and leaning way out over the steep staircase to retrieve something! At some point an enclosed back porch was added, and some of that was used for storage too. The house had no fireplaces. It was heated by steam radiators - a coal fired boiler was in the cellar. Water had to be pumped from a well by hand - the pump was over the kitchen sink. Upstairs there was a bathroom with no plumbing, but it had a claw-foot bathtub, a washstand with a ceramic bowl and pitcher, and a toilet with a pail that had to be emptied outdoors. Whenever practical, the two-seater outhouse was used instead. Years later, water was plumbed into the house, and a hot water tank was located in the small bedroom. Light was initially supplied by kerosene lamps, then gas lamps, and later still by electricity generated by a windmill and stored in a battery in the cellar. Grid power came to the farm in 1953. The house had three bedrooms, and Ryley and Myrtle eventually had eight children. There was a time when all eight of them were living at home, which must have made things a little cramped, to say the least. The five boys had the biggest bedroom, the three girls had the medium one, and Ryley and Myrtle slept in the smallest one. My mother remembered the house with great affection, and apparently never thought it was too crowded. with its enclosed porch. The front porch was long gone. By the late 1950s, the house was looking a little tired, and the front porch was so badly rotted, it was removed. And then the whole house was covered in aluminum siding, largely by my father. Ryley passed away in the kitchen of this house in 1962, and Myrtle stayed there for several more years, with one of her sons. When they left, the house fell into disrepair, and after many years of neglect, it burned down in 1999. There's nothing left on the property from my grandparents' time there, but the house is fondly remembered by myself and many cousins who spent time there as children.